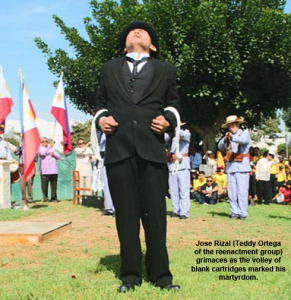 In his book Rizal Without the Overcoat, Prof. Ambeth Ocampo mentioned that although Jose Rizal was denied his request to face the execution squad, he managed to twist his body at the last moment and fell to the ground with his face to the sky. The way he wanted it. Ocampo’s book also dealt on the matter of coup de grace. The soldiers granted Rizal’s other request that his head be spared from the damage of gunfire but that in the end the squad leader delivered a fatal shot on that very same spot to make sure Rizal was not feigning death. That much was ascertained about the martyrdom of the national hero and portrayed during a recent reenactment of that historic Dec. 30, 1896 execution. But even as suspense gripped the crowd culminating in the volley of blank ammunition fired by rayadillo-attired Spanish soldiers — the finishing shot delivered by actor Frank Paras, Jr. — many controversies remain unsettled about Rizal: the women in his life, his alleged retraction from Freemasonry and return to Catholicism, whether or not he incited the revolution as charged by authorities or instead repudiated it or was he an American-made hero intended to safeguard that country’s own colonial rule. Members of the Filipino community, city officials and invited guests were gathered in a grassy area next to the Carson Community Center on September 29 to witness the unveiling of the eight-foot tall bronze statue of the Philippine national hero. Mounted on a six-foot granite pedestal, the monument is said to be one of its kind in the whole U.S. The Carson event was a fitting start for the yearly observance of Filipino American History Month in October. In his remarks, Mayor Jim Dear said that the city sent out 50 identical letters to the legations of different countries inviting them to donate an art piece each for the newly established sculpture garden. The Rizal statue, the work of Filipino sculptor Toym De Leon Imao, is the first in the site ¬¬– a gift of the people of the Philippines to the people of Carson, Mayor Dear said. No tax money was involved. The Carson executive explained that being the most diverse city of its size, Carson needs to have a public art showcase reflecting that fact. He got the inspiration from the sculpture garden in the nearby city of Cerritos, he said. The word international was suggested by FilAm alderman Elito Santarina of the Carson city council. The mayor foresees that other countries will follow the gesture of the Filipino community and turn the place into a truly International Sculpture Garden in the near future. Councilman Santarina was assigned the task of introducing the many community and business leaders and other guests who attended. Among the dignitaries were US Representatives Janice Hahn and Laura Richardson, Philippine Consul General Mary Jo Aragon, Chair Serena I. Diokno of the National Historical Commission of the Philippines, Deputy Consul General Daniel Espiritu, city officials of Cerritos, Torrance, Gardena and Carson. There were delegations from various entities and organizations including the Knights of Rizal, the Knights of Columbus, Harbor City College, La Salle-California, Philippine Scouts, the consulate general, Filipino American regional associations, the Fleet Reserve, ERB Foundation, Guardian Angels, Ateneo Alumni Association and others. California Senator Ted Lieu sent a representative. Two descendants of Jose Rizal — Renato and Benjamin Rizal — were also present. Congen Aragon expressed thanks to the city and officials of Carson and all those responsible for making the project a reality. She noted that it took all of eight years to arrive at that moment in time and she touched on the special significance of the occasion for her because the following day she was scheduled to relinquish her post for reassignment to the home office in Manila. She intoned that “before I leave Los Angeles as consul general I bear witness to the unveiling of the Rizal monument” after which Mayor Dear and Community Library Manager Leticia Tan, a Filipina, were requested to come over to accept a few copies of donated books about FilAms in Carson. Congresswoman Richardson commented about how the generations yet to come would benefit from knowing about the history and good works of Rizal. She will be filing a resolution in Congress to declare October Filipino American History Month, she informed. Congresswoman Hahn likewise congratulated all those responsible for the historic event and said that the significance of Rizal is not just for the Philippines but for the U.S. as well. Rizal will forever remind us to strive for peaceful resolutions of conflicts, she said. In her keynote speech, Chairperson Diokno saluted the Filipino community for uniting and successfully coming up with the monument. She cited some highlights in the life of Rizal and at one point mentioned that being a humble guy, he would not have approved of the grand scheme were he around today. Other parts of the program were the entrance of colors, the singing of the national anthems of the USA and the Philippines by the Immaculate Heart of Mary Children’s Choir, an invocation by Rev. Thomas Naval, a message by Tom Rodriguez of the Knights of Rizal and remarks by Chito Mandap of the Jose Rizal Monument Movement. Hollywood thespian Dante Basco read Rizal’s poem, A La Juventud Filipina, and another work of the hero, “My Last Farewell,” was given stirring performance by Teddy Ortega of the reenactment group. Emcees of the program were Janelle So and Alex Cainglet. Chairpersons for the historic event were Mayor Dear, Councilman Elito Santarina, Chito Mandap and Antero Pagunsan. From his bio we learn that Jose Rizal wrote a Tagalog poem, “Sa Aking Mga Kabata,” when he was eight years old and had an AB degree (sobresaliente) at 16. At age 17 he passed the Surveyor’s examination and was conferred the degree of Licentiate in Medicine at 23 by the Universidad Central de Madrid. In 1885, at the age of 24, he finished a course in Philosophy and Letters with highest honors. A polymath, he was an artist who dabbled in painting, cartoons, sketching, sculpting and woodcarving; a prolific poet, journalist, novelist, an architect, businessman, educator, economist, agriculturist, ethnologist, historian, inventor, musician, mythologist, nationalist, naturalist, ophthalmic surgeon, propagandist, psychologist, theologian, scientist and sociologist. He was also a polyglot, conversant in twenty-two languages and native dialects; an expert swordsman and a good shot. He preceded Gandhi and Sun Yat-sen in the art of political agitation. Many of his writings dealt on nationalism and zeroed in on the arrogance and abuses of the Spanish colonizing regime and the friars who controlled much of politics and society during that time in Philippine history. The “Noli Me Tangere” and “El Filibusterismo” particularly gained the ire of the church and Spanish authorities prompting his incarceration in Fort Santiago. Later he was exiled in Dapitan where he continued to engage in peaceful activities benefiting the people. In 1896 the revolutionary movement in the country was getting to be a serious threat to the occupying regime and it didn’t take them long to link Rizal to it. In November of that year he was back in a prison cell at the fort. Convicted of trumped-up charges, Dr. Jose Rizal met his martyrdom in Bagumbayan (now Luneta Park, Manila) soon after.